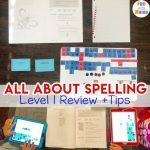 This Barton Reading and Spelling review post is exactly what you need if you feel like you are at a loss for how to help your child with their spelling challenges. My child had problems with spelling but not reading and I felt like I had tried everything. We were frustrated and demotivated, but I believed in my child. I will ALWAYS believe in my child. I will move mountains for my kids. I will always try my best to help encourage them to reach higher and never settle for less than their potential. With hard work and determination, anything is attainable. When we finally found the Barton Reading and Spelling curriculum it’s like we finally found the magical cure to our spelling challenges. That’s not to say that it was an easy fix. Barton is a very comprehensive and thorough curriculum. It takes a lot more time than anything else we tried, but somehow.. it began to work on my child’s spelling trouble. I’d suggest you read this post first, why parents should be proactive in their child’s education. It will help you understand our journey to the Barton Reading and Spelling system and why it was needed. Please note that I purchased all the Barton products myself and understand any concerns about the price point for this product. 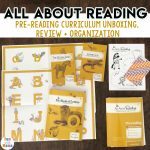 It definitely is higher than the other curriculums and spelling activities I recommended, but I do believe it is worth the price. Amazon links are affiliate links in this post. 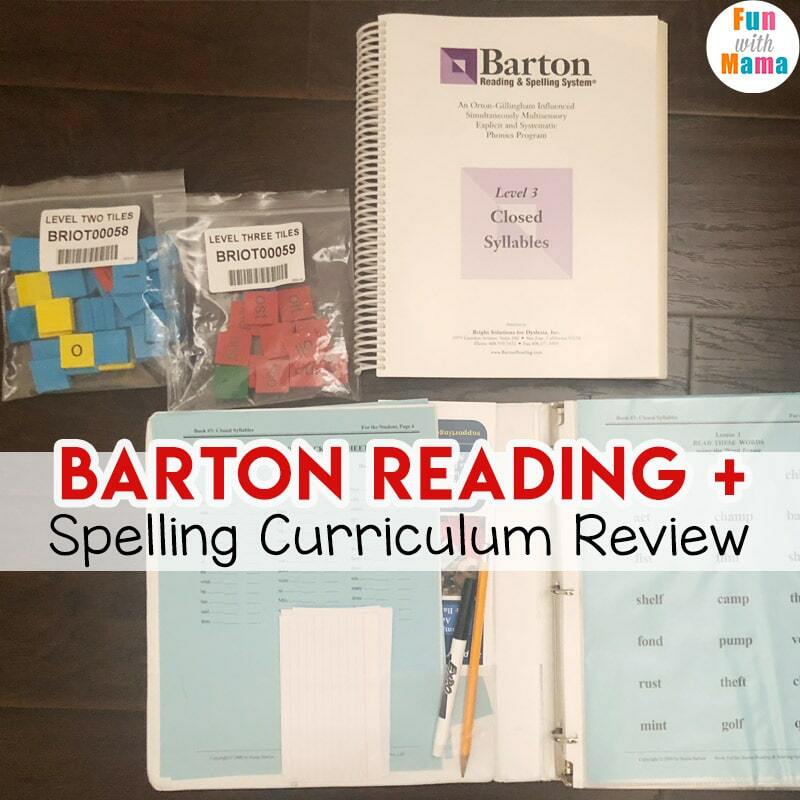 I wish that all teachers who are teaching elementary grade students would be trained in Barton, or would at least know some of the methods used in Barton so that they could actually teach spelling and reading in a way that helps children understand spelling. I also think it’s important to know that I did not start both my kids on the Barton & Spelling System. I didn’t want to spend more time on something than I needed. I’m a busy mama of three so I am only using it with the child who needs a more comprehensive spelling curriculum. My other child will carry on using All About Spelling. As I mentioned before, we all learn differently. 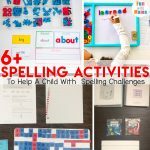 Check out my progression of Spelling Activities for kids to see how I would start spelling remediation. Barton requires children to be tutored individually and I agree. This allows you to assess how much they are taking in and helps you really focus on their individual needs. Each lesson takes us around 30-40 minutes (once we got to Level 3). Barton is a structured literacy program that is Orton-Gillingham influenced. It is a multi-sensory, structured and sequential intense intervention program that is research and evidence based. 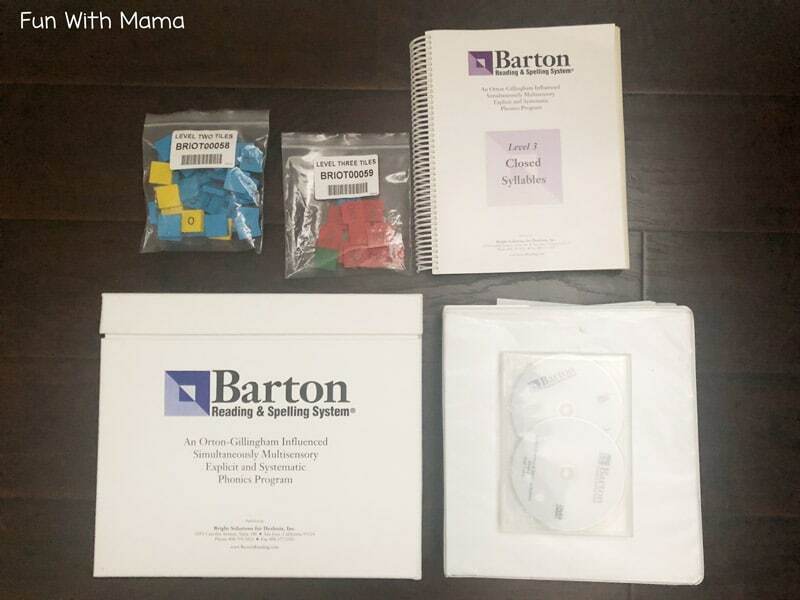 There are ten levels in the Barton Reading & Spelling System and it is really important that you start at the first level in order to get the full benefits of the program. 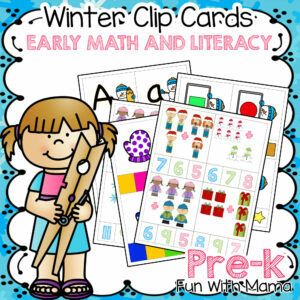 Each level moves at a different rate and depends completely on how fast your child picks up and understands the material presented. 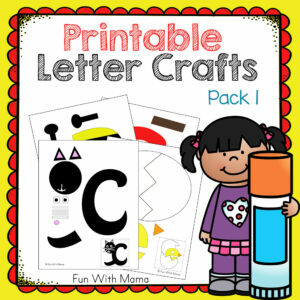 Each level comes with a parent instructional DVD that helps parents and tutors learn HOW to teach that level. These instruction video’s are rather long and I’d say, the most time consuming part of the program. I was concerned that it would be hard to teach Barton because I didn’t really know the spelling rules either. I was just somehow a naturally good speller. These instructional DVD’s and highly scripted lessons means that there is no guess work. Consider the DVD’s training DVD’s. The lessons are also scripted telling you exactly what to do and say. You can check out an example of how the lesson is scripted using the example page here. While there are 10 levels a child does not, however, have to complete all 10 levels. You can stop when you want. I will likely go up until level 8 with my son. Level 10: Greek Words and Latin Roots. It is recommended that a child completes 2-3 hours a week of Barton Tutoring spread across 2-3 days of the week. The more lessons you do, the faster your child will progress. 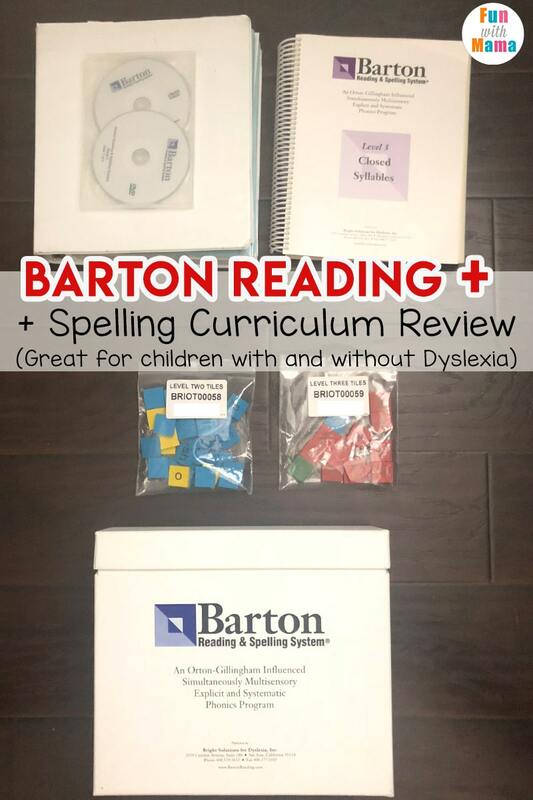 Barton was created for adults and children with dyslexia in mind. That is actually one of the reasons I did not opt to go for it sooner. We have no dyslexia diagnosis for any of my children. But, it doesn’t matter! 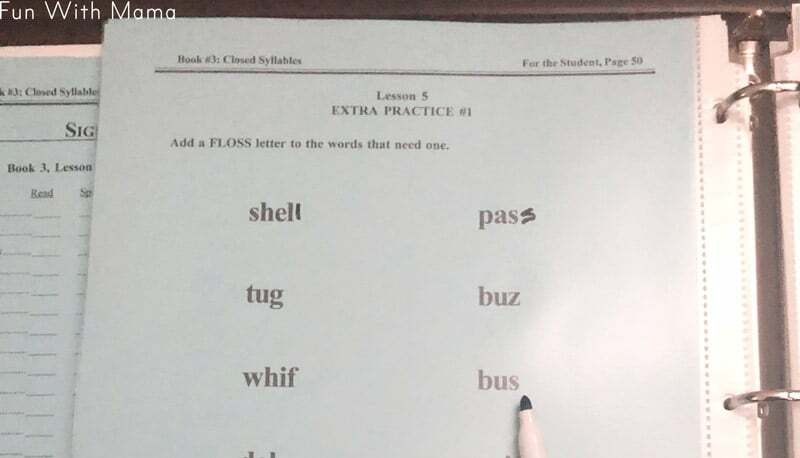 Because Barton does work… even for non-dyslexic children. Also, my child is in the highest reading level at school so we obviously didn’t need any help with reading. I thought I would need a spelling system instead. Barton works on both reading and spelling and that’s okay. 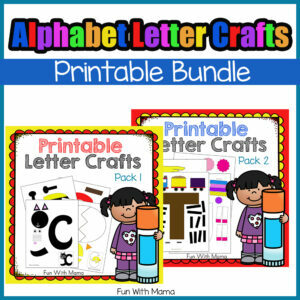 Each level comes with some letter tiles, a book, worksheet type of papers, reading handouts and instructional DVD’s. The instructional DVD’s are also available online if you do not have a DVD player. There is also a Barton app that can be used instead of the letter tiles, but I haven’t tried it yet. Each level will take you a different amount of time. Level 1 took us 3-4 days and initially I was a little disappointed in the system because of that. 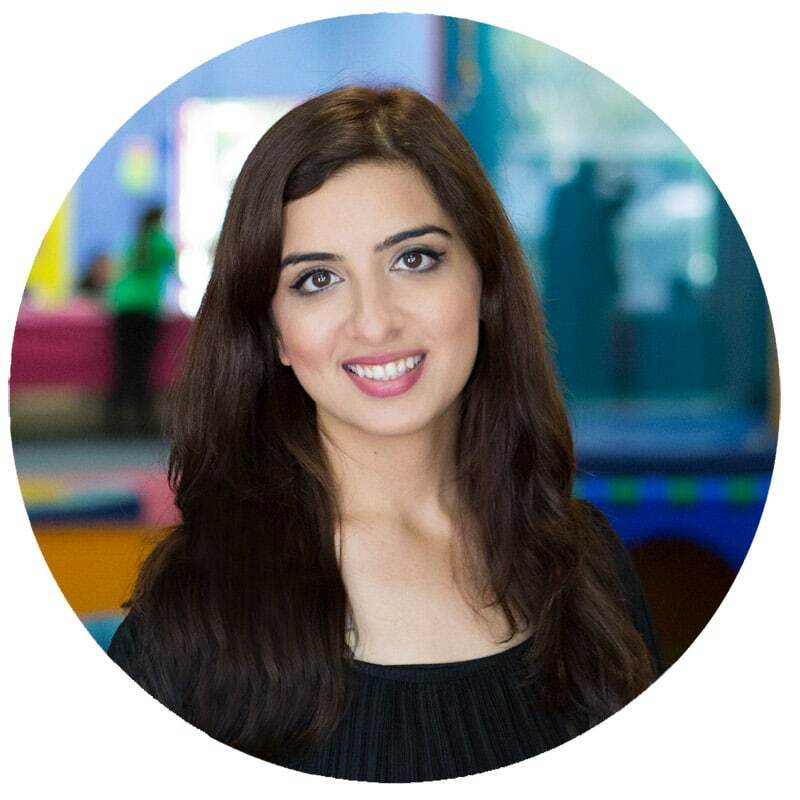 However, once I began to work through the other levels I realized how important level 1 was to give a child the foundation of phonemic awareness. 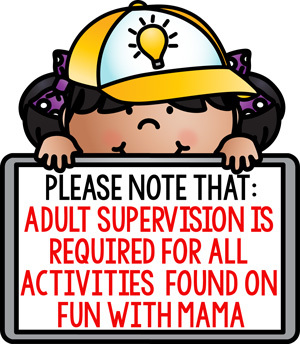 Basically, think of level 1 and 2 as filling in any gaps if you are working with an older child. There are also different options for each lesson. 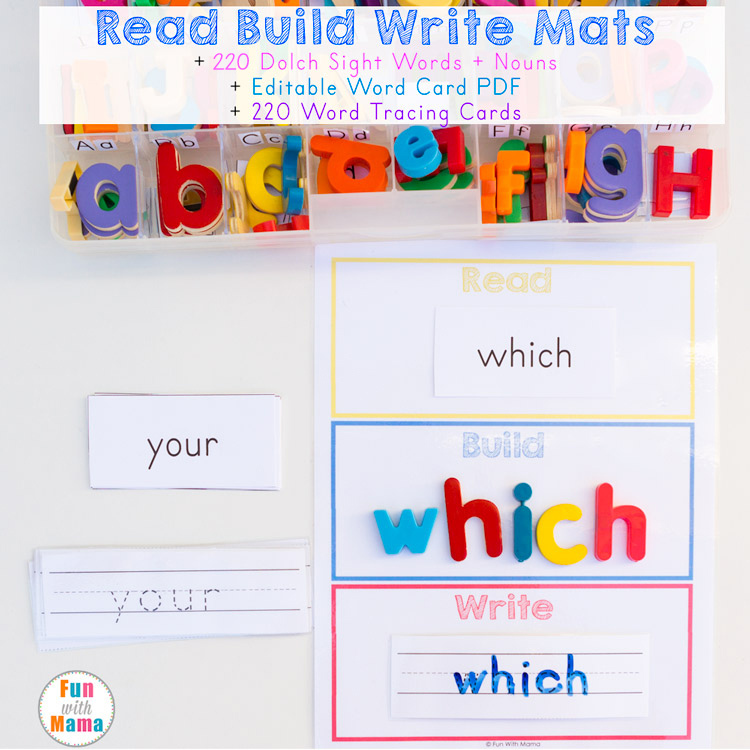 The handouts have an easier version and advanced version for children who need more of a challenge so you can tailor fit it to your child. I put all the handouts in a binder with page protectors. So we use an expo marker during the lesson to complete these pages. 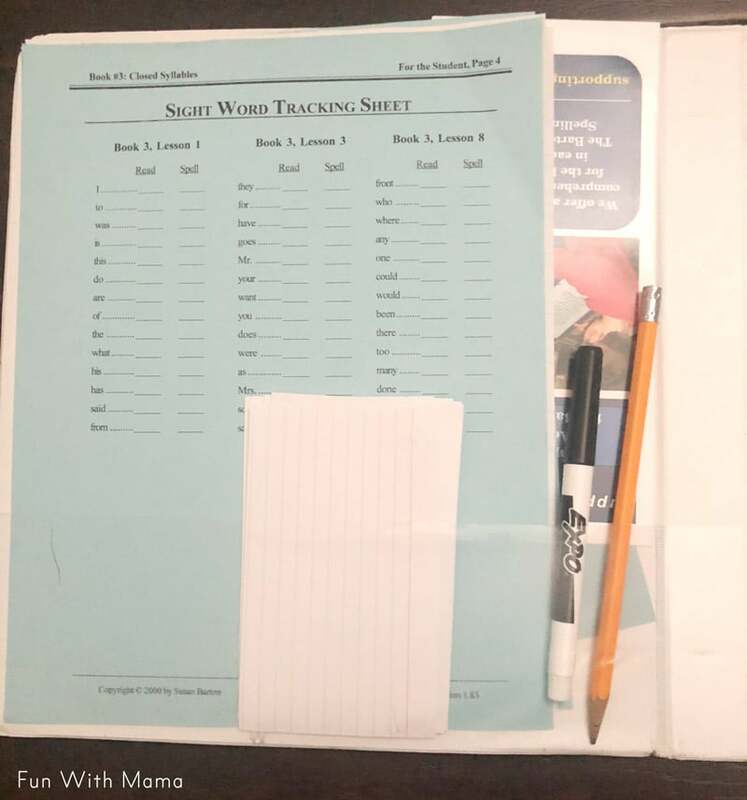 I also keep a pencil, expo marker and extra flash cards (for the sight words) in my folder so that it’s easy to get everything I need for that lesson. It works! Well, it worked for my child and that is the best pro possible. Can swap out levels to find the right fit. Has a good re-sale value if you choose to sell it afterwards. Easy for parents to teach. 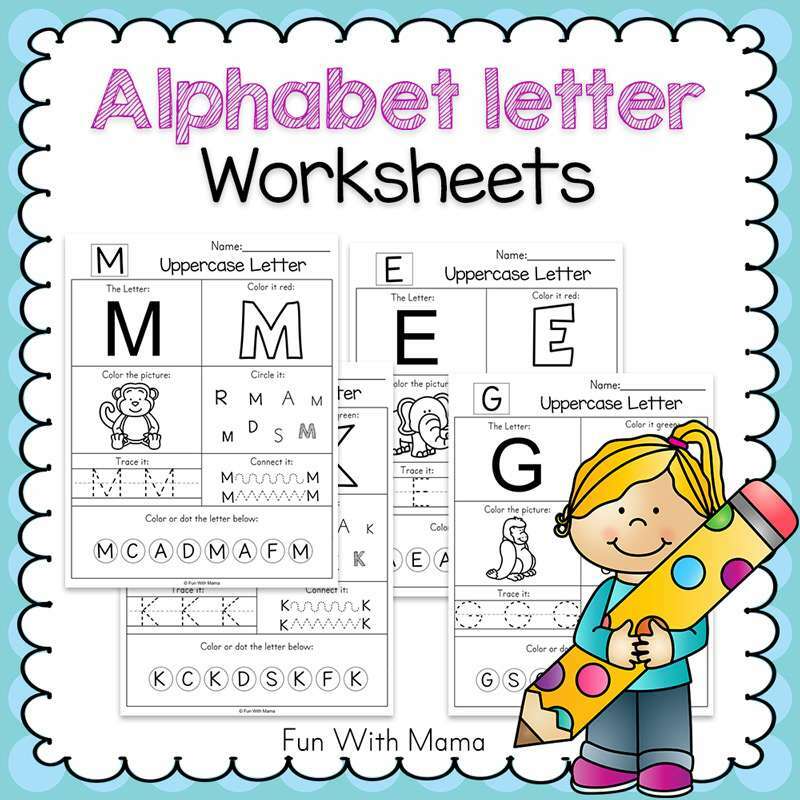 The spelling rules are easy to understand and have catchy names so that a child can easily memorize it. Finger spelling for SOUNDS was very helpful for my child. Barton levels are expensive. Level 1 + 2 are $250 each and level 3-10 are $300 each. Also, with level 1 taking us less than a week to complete you can see how that would feel a little expensive for what you are getting. Susan Barton is so understanding of this and truly believes in the value of starting on level 1 even if a child is more advanced. If you complete your level fast (within a certain time frame), she will swap out that level for you and give you the next level.I did a swap on level 1 and 2. Level 3 is where we got to the meat of filling in the gaps and is where we have currently settled. This level is taking us a lot longer than level 1 and 2 and is perfect for us. Time intensive – It really does take a lot of time to watch the lesson instructor training dvd and then do the lesson. As you can see, we are very happy with Barton and feel like we found our spelling cure. What have you tried for spelling? Are you happy with the curriculum you are using?